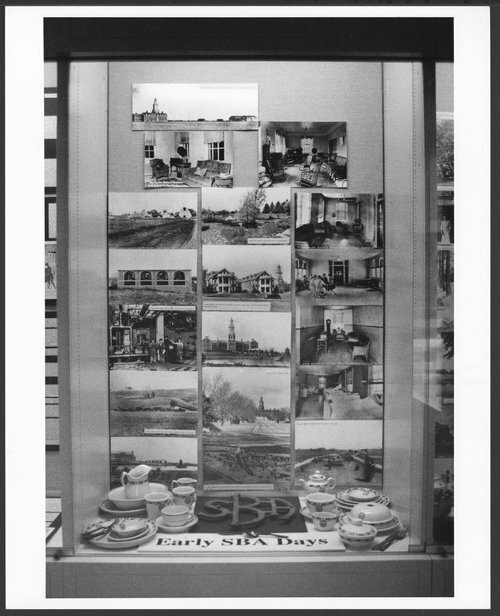 These black and white photographs show the museum exhibits in the cases in the Tower Building reception area. Dr. C. F. Menninger and his sons Karl and Will formed a group psychiatry practice in 1919. The Menninger Clinic as a sanitarium was established in 1925 with the purchase of a farm house and admittance of 12 patients. Their philosophy was that mental illness could be treated with an integrated medical, psychodynamic, and developmental approach for the total health of patients. Exhibits in the Menninger museum, Topeka, Kansas - The Security Benefit Association (SBA) built a medical hospital, an orphange, a home for the elderly and apartments for the staff. SBA was formerly the Knights and Ladies of Security, an early form of social security financed by a nickel a month dues.